We recently sent out a Survey to all Boat Owners past and present of which we had a fantastic response. I have listed below a couple of the questions that were in the survey and the responses. I hope you find it interesting. How do you rate the helpfulness of staff? How do you rate the level of service given to you upon arrival at Thornham Marina? How would you rate the cleanliness of the Marina? How would you rate the Lift Out/Re-Launch procedures? How would you rate the way your boat is looked after/during your stay? How likely are you to recommend Thornham Marina to other Boat Owners? If you would like to see a full copy of the survey results please let me know. • An invite to our Annual BBQ (Not to be missed with Jeanette's Special Pimms! If you would like all of this and more call 01243 375 335! 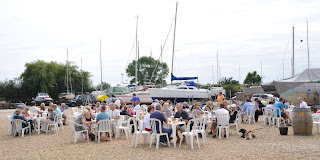 Please click here to read the latest newsletter from Thornham Marina. Remember to call us on 01243 375 335 if you would like any more information. As promised another little video from Jeanette with the updated progress on the works. The new pontoon's have now arrived in the yard and the Walcon guys are busy putting them all together ready to go in. Don't forget to check back next week for more updates! Here's two little videos that Jeanette filmed whilst down having a look at the progress of the replacement works. 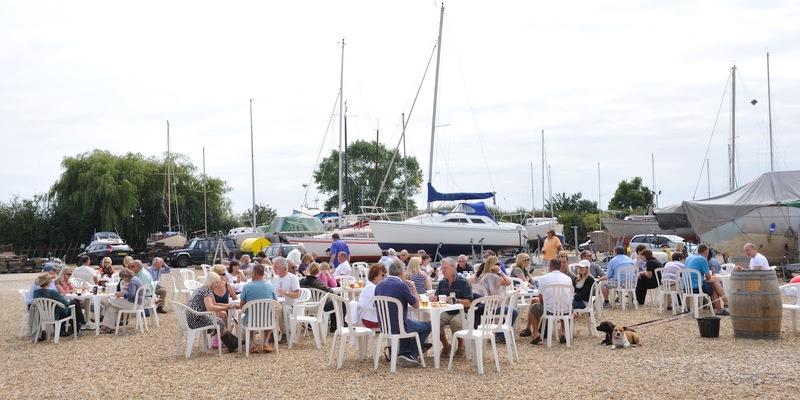 Collective Spirit was launched at Thornham Marina over the may Bank Holiday. Check out this BBC article with a fantastic video showing you the superb detailing in the boat. Please be aware that whilst works are carried out to replace the pontoon's there will be some disruption to power/water supply. At present the water supply to pontoon's has been switched off, however water is still available in the yard. Power is working at present, however may be switched off for short periods of time throughout the works. If you are planning to come down to your boat and require a power supply please call the office on 01243 375 335 so alternative arrangements can be made. We apologise for any inconvenience this may cause but would like to thank you all for your co-operation. The Work Has Begun - Whooooop Whooooop! The guys from Walcon have arrived in the yard & started work! After a long 2 year planning battle, work has finally begun to replace the 'loved' existing pontoon berths. The Team at Thornham are so excited to see the completed look, as are our boat owners! The present pontoon’s were installed in 1990 with a layout that was acceptable for that time. The proposed layout is designed to comply with today’s standards as advised by The Yacht Harbour Association and the British Marine Federation. This will allow a greater turning circle for berth holders to enter their berths. They will also have an electricity supply to each berth. There may be a little disruption to berthing arrangements until the work has been completed but please call Jeanette in the office to find out more on 01243 375 335. Jeanette has been popping down some morning's to film their progress so i will try to keep you all updated as much as possible! Jeanette would also like to say a big thank you to all our berth holders for their co-operation through out the busy period and their ongoing support. On Monday the 7th May the Boat Project Boat (yet to be named) will be launched to set sail on her maiden voyage. A 30ft Day Sailer designed by Simon Rogers looks like a completely normal boat on paper, but in real life she is different to any vessel previously built. The reason she is unique is because she has been created from 1000’s of pieces of wood donated from all over the world. But these weren't just any pieces of wood - each piece has an unforgettable story or a fond memory behind it. From a shaving of Jimi Hendrix’s guitar to a child’s first wooden train set, each item has been carefully placed to create this fantastic vessel. For the past year the boat shed has been a hive of activity with momentous occasions taking place, and on Monday the 7th of May the boat will be launched in to Thornham’s deep water pool. 100’s of people from all over the south coast will be arriving at the marina on this day to watch their memory float for the very first time. The launch itself will start from 1pm with Live Music, Food, Drinks and Celebrations plus special guests (yet to be revealed)! This will be a ticketed event with limited parking spaces so please let us know if you intend to be visiting the marina on this day via car. For non boat owners of Thornham please contact The Boat Project or call 01243 374 888 to find out how you can attend. For Boat Owners of the Marina, we have a special VIP area but spaces are limited so please call or drop us an email if you intend to come along for the day. Please feel free to bring your own picnics and deck chairs to make yourself comfy! We hope to see you for this spectacular event!